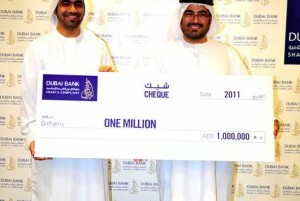 A one-year-old Emirati boy has become Dubai’s latest millionaire after winning AED1m in Dubai Bank’s savings account draw. Mohammed Rashid Bin Fatise Al Mutiwei scooped AED10,000 in each of the July and August draws before becoming the youngest ever winner of the million-dirham cash prize in September, the bank said. Al Mutiwei’s father, Rashid Khalifa Bin Fatise Al Mutiwei, won the top prize two years ago and invested the full sum back into the Kunooz accounts for each of his children. Al Mutiwei said he would do the same for his son. “On my son’s behalf, I will invest the full one million back into his Kunooz account, meaning he will have many more chances to win before he reaches adulthood,” he said in a statement. Nine of out of ten residents in the UAE in June said they were worried about not saving enough. Residents in the Gulf state blamed rising costs and efforts to pay off loans as their biggest concerns in a National Bonds Corporation survey. Nearly three quarters of respondents (71 percent), admitted that they do not save regularly, with just under a tenth saying they did not save at all. Of the latter figure, most blamed higher expenses and loans for their inability to save. Breaking the data down by nationality, the survey found that UAE nationals and Western expats are saving less than in 2010, while Asian and Arab expats are saving more.